You are currently browsing the category archive for the ‘health and lifestyle’ category. 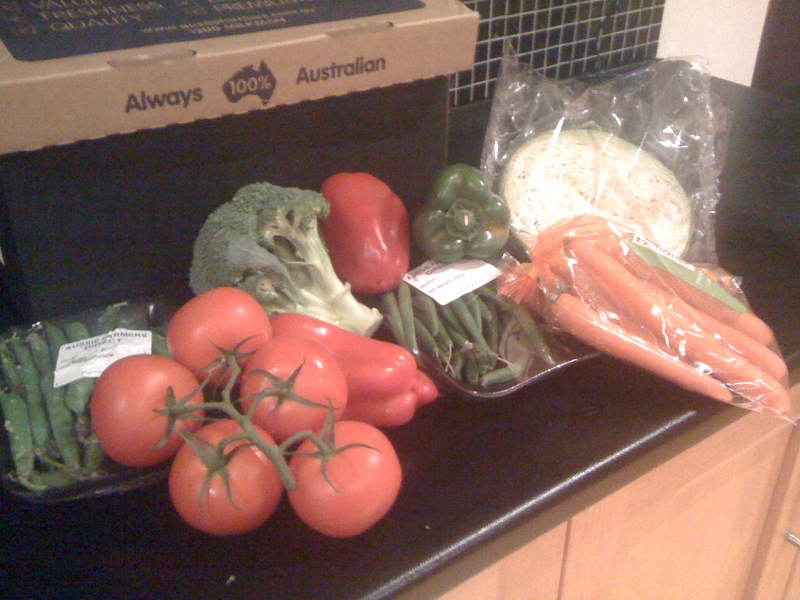 A friend had recommended Aussie Farmers Direct for their random fruit and veggie box delivery. I had previously looked into a couple of options for this, but none seemed convenient to my area. So I signed up for an account and set up a couple of one off deliveries to see what it was like. They have two sets of delivery – one for meat, eggs and dairy which is delivered before 7am in the morning, and one for fruits and vegetables which comes sometime in the afternoon. I have a meat, eggs and dairy order coming next week which should arrive before I leave for work. For the fresh delivery it seems you buy a reuseable cool bag which you put out the night before. For the veg delivery, they bring you a lovely (and very practical) box. I am totally using these things to reorganise my garage. There’s some broccoli, red and green capsicum, carrots, beans, peas, cabbage and some truss tomatoes. The quality as you would expect from produce direct from farmers is a big step up from the supermarket options, though not at the organic boutique produce level. Probably at the standard of a good fresh market. If I went to a fresh market, I am sure that I could get cheaper, but I tend to do a semi-regular veg shop at the supermarket where I pick up these basic items and rarely come out spending much less than this. So in terms of value and convenience this is a big win for me. I cooked up a bunch of veggies with some kanga meat chilli tonight and it was fantastic. So far I am sold. If the quality continues to be this good and the service as good, I might just switch to a regular order. It was so nice to have a long weekend in Melbourne just gone. We spent the Saturday with the help of our friend taking some old white goods to the tip, along with some general crap which was cluttering up our carport. It was nice to see all the junk areas cleaned up at long last, but it is amazing how quickly you find more junk. In this case, our junk was washing machines, dishwashers and fridges which had crapped out at various times over the last couple of months. And when you get the replacements, you suddenly have another big cardboard box and packaging which doesn’t in and of itself fit in your normal garbage. It took less than 24 hours for a new box of crap to find its way there. This is because we finally decided to chuck out my heirloom family microwave. As our weekender is our second residence (we live the rest of the time in a house owned by Hub’s work), our furnishing of both houses is a mix of new stuff and bizarre hand-me-downs. In this case, my parents had offered the use of the very first microwave that our family owned growing up. It dated back to the 1980s (still working) and this weekend we finally admitted that it was probably spewing all sorts of unhealthy rays at us, and to add to that it was the size of a minivan. So no sooner than we had cleaned out all of the crap (including the mini-van microwave) than we had more boxes and packaging (from the new microwave) to fill the niche. Sigh. I think I got the worst end of the stick though. While the boys were carting whitegoods on the trailer, I was left with cleaning up the mess left behind said white goods (two of the fridges hadn’t been moved since we bought the place). Ugh. When we finally got back from our various chores, we realised the downside of our unintentional failure to do any shopping. We had stuff in the house we could eat, but nothing to snack on. Who wants broccoli for lunch? Instead of going for a shop, we proceeded to indulge mightily on 3 or 4 separate occasions over the weekend. We still didn’t go shopping as we had real food in the house, but we talked ourselves out of real food and into hamburgers (they were real hamburgers from a fish n chipper so they tasted goood) and later into pizza (again, at least it was good quality pizza). So eating wise, the weekend was a write off. That being said, we didn’t regret it for a moment – just a long weekend version of a cheat day and it helps that we were sufficiently restrained that none of the indulgences left us feeling gross. But the long weekend is over and we don’t get another one until June, so it is back on the almighty bandwagon until then. Needless to say, the steady downward progression on the scales stalled this week somewhat (though by no means disastrously), but I have no hesitation in saying it was TOTALLY WORTH IT. Oh and thanks for those with advice about the bike buying below – have added some more information so if anyone has more suggestions they will be gratefully received. I keep forgetting to keep up with the old blogarooney over here. The problem is that I don’t do that much which is interesting. At a certain point it becomes more of I-went-to-the-gym-again-and-then-came-home-and-ate-some-protein-and-vegetables. And frankly, repetitions of those sort of posts would just bore me (and doubtless everyone else) to tears. Everything is going well, though, which I can be thankful for. We finally got our shower back. It is AWESOME. The weather is weird. Stop that. Sasha the dog shaped girl has been having some health difficulties recently (again). Poor girl is getting older and we are on a campaign to fatten her up – every time she gets sick she loses more weight and she is on a restricted diet so it is very hard to get her to bulk up. Trying to convince her to carb up, but she prefers to eat lean and clean. Wallet stolen and car broken into which is now three thefts separate thefts/break-ins in less than six months. Apart from the hassle of replacing cards and so on, it did give me an excuse to geek out over getting the best replacement wallet. We also managed to get the GPS stolen from our car back after the cops arrested the “gang” responsible and called us cause our address was listed as “home” in the GPS. Since then heaps of people have told me that you should never list your own address as “home” in the GPS cause it means people will know that you are out and then come and break in to your house. Seems like a much bigger hassle than just looking in someone’s driveway to see if they are home and choosing to break into *that* house. So in my current edition of “turn over a new leafness” I took a piece of advice from one book and elected to get myself a pair of thermometer pants. Now I had already got myself some scales which show body fat percentage and started to take some regular measurements and various other steps to judge how the process is going without relying solely on the scale. I didn’t want to be discouraged by the failure to “pull big numbers” so the idea was to have some alternative measures to see how things were going. As it happens, at least so far, my efforts to concentrate on what I am eating and in particular to cut out white and processed carbs has kept the scale ticking over at an unprecedented rate of knots. Hm, maybe doing some of that previously might have been an advantage. However, one measure which I have quite enjoyed is the thermometer pants. The idea is to get a pair of fitted pants (I took from this that tracky dacks would defeat the purpose) which are one to two sizes too small for you. The idea is that you try them on again every so often and you begin to notice that at first you can’t get them past your thighs, and then one time you can’t get them past your hips, and then you can put them on but can’t get close to doing them up etc. I chose a pair of jeans that were probably only a size too small. I had bought them because they were a super bargain and the tag misrepresented the actual size of the item (I hate that). As such, though I wear some items that have the same size written on them, when I tried in early January I couldn’t get them past my thighs. Even if you know something is too small, forcing yourself to actually see how far you can get into it is pretty demoralising. Anyway, although I had been feeling much more comfortable in my clothes and retiring an item or two at the top of the range, I hadn’t tried on the thermometers for a while. At last try they had not managed to get over the hips. I was going through the wardrobe looking for replacements for recently retired items of work clothing when I saw the thermometers lurking. On a whim I decided to see how they went. To my great surprise, I managed to get the zip up and the button fastened. Now, by no means would you say they *fit*. There was some incidence of muffin-toppage, and I don’t know what the tensile strength of the denim was to be able to cope under the onslaught for very long. But I was thrilled. At this rate in another fortnight or so I will be on the lookout for new thermometers. So far I have found it a particularly good measure of my progress, so next time I am tempted to go with both bottom and top thermometers and might pull out one of my funky button-up shirts whose buttons haven’t met in a while and see if they can prompt similarly successful progress. It will surprise nobody who knows me well for me to admit that I am something of a clutz. If there is a way to smash myself, knock myself or cut myself from being completely uncoordinated, I will manage it. At the moment things are at a particularly low ebb, coordination wise. First there was the falling in the small-arsed shower incident. That led to a rather alarming collection of quite vivid bruises. I don’t know what from, as there isn’t actually that much room for things to fall on in the small-arsed bathroom, but I managed it. Then this weekend, while trying to deal with some surplus produce, I decided to whip up a couple of batches of fruit wine (in this case, a nice plum/apple and a plain peach). It is something of an artisan hobby to make wine out of all kinds of vegetables, fruit and herbs. I got into it as an extension from homebrewing beer. It is quite fun in a global sense, but choosing to prepare two batches of starter in the space of weekend when I hadn’t done it for a while had me mightily pissed off by the time I got halfway through. It is a bit fiddly and it is one of those “cleanliness is king” type pursuits so as to avoid any introduction of contaminant into your ingredients. So I was in the bathroom crouching next to the bath scrubbing out one of the big 24L fermentation vats. I stood up to carry the thing out to the kitchen, put my pretend crocs on a patch of water and go for an absolute flyer. This wasn’t in the small-arsed bathroom so there was plenty to hit, and I ended up rapping my wrist pretty smartly against the door-knob. So now I have a quite visible and quite painful bone bruise there. I took stock this morning as I was getting ready for work and I seriously look like I have been in the wars. It’s one thing for my nieces and nephews under the age of ten to get about covered in bruises and scrapes, but it looks a fair sight less impressive on a thirty-something professional. So I opted against a skirt and grabbed the pants suit for work today and vowed to keep the jacket on. And unfortunately my unco nature has been further supported by spending the day having to hitch up my pants, as they have passed the point of being comfortably wearable for work. While a nice problem to have, it means I might have to stick with showing off the bruises until the next size down start fitting properly. I just hope people believe me when I say I bumped into the door. So the food adjustment has been a little interesting, particularly removing the white carbs. The results have been impressive though so I am sticking with it. I had kind of fallen into the habit of eating a carby bulk with every meal. So adjusting my eating to be basically meat and vegetables has been challenging at times. Part of it has been the fact that I like one bowl eating and typically have some rice or pasta to soak up the juices of the stir fry or curry or what have you. So as much as I am happy with the eating now that my proteins are largely fish and eggs, sometimes I feel like I am missing the texture of having a rice or pasta with my meat and veg. And the answer seems to be cabbage. I have had so many variations on chow mein since starting this eating regime. Meat and vegies and then just stirfry down a bunch of cabbage. Texture wise it seems to mimic noodles or something so psychologically at least I am feeling like it is more filling. And it is so bloody easy. While I normally like toasting spices etc, for a quick meal after the gym or some HIIT, it is hard to go past a quick stirfry and some (good quality) curry powder thrown in. And cabbage (even a lot of it) is low calorie and high in vitamin C – particularly great if you are like me and hardly eat fruit ever. About an eighth of a head of cabbage (I tend to get the quarter head and use it for two meals). This month am trying to get used to some new particular eating adjustments that I haven’t really done before. I have always been a fan of just a general clean eating approach and tended to find most low carb diets that people talk about packed with red meat and animal fats – something I don’t really get along with and can’t really see as particularly healthy. Well those are the main differences from my normal healthy eating regime. I am too guilty of skipping meals and never having snacks, leading to my evening meal being more likely to be a splurgey mcsplurgefest, which is particularly evil given that my routine has me often eating dinner quite late. The program I am reading about basically describes this as the general good eating stage, and suggests that you should stick to the rules for 90% of the time. So it is not a scheduled night or day off, but more that you can break those rules a 3 or 4 meals a week if it is a small departure or maybe one meal a week if you are going to splurge. At the moment it seems to be a sustainable plan. I am not being completely strict on it either to start with, just trying to introduce some better habits. Since implementing some little changes the results have been pretty promising so I will taste test and adjust as necessary. So far I have been pleasantly surprised at how easy it is to get the required protein through fish, chicken or eggs so that I don’t feel compelled to eat red meat (which I sometimes love, but only in small doses). And I for one that actually loves vegetables, I am so far finding that I am eating more vegetables in greater variety than I did before. The urge to rebel came late with me. At heart, I really don’t have the need to do the “bad girl” thing. I never really drank alcohol while underage and my flirtations with drugs were so laughable as to be rather naff. So I was never tempted to join my friends in year seven and eight who snuck cigarettes while sitting on the middle of the oval (hiding in plain sight, I guess). I didn’t like the smell and couldn’t see the attraction. Plus I had the sort of moralistic attitude to self-abuse that only the young and naive can have. I had grown up in the era of the squeezed out lung and the worst of the anti-smoking advertisements. In primary school I had so many “healthy body” classes warning against smoking that I could recite them by rote. I was a swimmer at that stage and prided easy breathing above all else. I couldn’t see the attraction of making yourself unhealthy. A few short years later the attraction became clear to me. Smoking was (and is) cool. After finishing year 12 and going overseas, I began dutifully ticking off the list when I accomplished things I shouldn’t be doing. Drinking till I puked. Check. Dabbling with pot. Check. Petty theft of souvenir glasses from famous bars and breweries. Check. Crude photos taken with naked statues that could not be shown to mum and dad. Check. In Europe, everyone smokes (or at least they did when I was there). Cigarettes are cheap and the culture of smoking is embraced. It’s not like in Melbourne where the pathetic masses are forced to huddle in the cold on street corners while pig-sucking the last few puffs from their winnie blues. It is all cafes and dim lighting so that the smoke can lazily spiral into the air. It is strong coffee and unnamed shots of pungent liquor served with a cigarette on the side of the plate. It is classy cigarettes of all shapes, sizes and smells, none of which is ever purchased in cartons. It is a smoke handrolled impossibly thin so that the ash barely glows when taking a drag. It is exotic cigarettes with exotic smells flagged only by a single gold band. Or, in the crowd that I was more likely to run with, it is crumpled softpacks of crumpled cheap cigarettes lit with one hand while with the other hand drinking amazingly flavoured vodka from the jam jars that your fellow young thugs had snuck out of their parent’s basements while sitting around a roaring campfire in the woods somewhere. Or a leisurely smoke while wandering through the snow covered city streets at 2am in the morning just back from seeing some incomprehensible polish jazz band while flirting with a sweet pommy boy impressed with how well you can speak the local language. In short, I started smoking. There were moments when smoking was as cool as it was then. Inevitably, on another trip to Europe standing on the balcony of my student room. The room was the size of a shoe box, but the balcony had a fabulous view across one of the greatest cities in Europe. Every night I would practise my newfound skill of rolling my own and stand on the balcony in the cold and look out across one of the cities that never sleep. And there were other times as well. But smokings potential for coolness in Australia had already passed, and smoking is something that you have to be ashamed of for 90% of your life, except when going out for a big night when all your non-smoker friends start scabbing smokes off you. And, to be fair, I had always hated that I was being incredibly unhealthy. I always had in the back of my mind that it was going to be doubly hard to get fit and start running together when I was destroying my lung capacity at a rate of knots. I had attempted to quit a bunch of times. But it just didn’t work out. It was the subject of a heap of silent and spoken New Years’ Resolutions. Then one day, Hub said something about it and all of a sudden, I wanted to make sure that I could do it. Damn it, I was thirty years old and had been smoking for over a third of my life. And so I quit. I had one bad moment a week after quitting when I fished the smokes out of the bin and had one more. But apart from that, it was surprisingly easy. With the help of some quitting lozenges and a bit of willpower, I managed it. And when I passed the point that the books said I no longer had any traces of physical addiction, I began to believe that I had managed (or could manage) to quit. Within a month or two, I had joined the gym. If I could manage to do that after all these years, then I can sure as hell manage to get myself fit again.